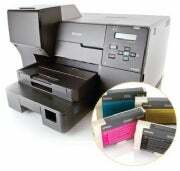 Editor's note: The following corrections have been made to this article: We should have said that the HP OfficeJet Pro 8000 Wireless inkjet printer has just one standard input tray and that the cost of the OKI C610dtn color printer is $799. Also, one product mentioned, the Lexmark Prestige Pro805, has been discontinued. PCWorld regrets the errors. Printers are money pits: You pay for the machine, and then you keep on paying more for the ink or toner it needs to produce your documents. With some lower-end models, your first set of replacement consumables may cost almost as much as the printer itself. But you don’t have to crack into your 401(k) just to run your printer. You can reduce your printing costs by buying the right printer in the first place—and keeping close watch on your printing habits afterward. I’ve done some of the hard work for you, though. In this story, I’ll give you my picks for the latest inkjet, snapshot, and color laser printers that save you money and still produce good results. Even if you buy a printer that’s relatively cheap to run, really saving money may require changing your own behavior. Make a habit of printing in draft mode to reduce ink or toner consumption, saving the nicest quality for customers or special occasions. Check your driver for “n-up printing” (also known as “2-in-1” or “4-in-1,” for example), which lets you squeeze multiple pages’ worth of content onto one sheet of paper. Print less, of course—which is easier now that sharing PDF files and other documents on­­line is becoming commonplace. Everyone knows that third-party, refilled, or remanufactured inks are cheaper than the inks sold by the original vendors. And many people go that route, despite vendors’ ef­­forts to coax, cajole, or scare them back onto the straight and narrow path. But what is it like off-road—are the horror stories from printer manufacturers true? Earlier PCWorld research indicated that the risks lie chiefly in print quality and reliability, which may not concern you if perfect prints aren’t your priority. Serious penny-pinchers do the reloading themselves; in “Portrait of a Serial Refiller”, I profile a man who refilled the same cartridge for five years before it finally gave out. Saving on printer costs starts with the printer itself, but it also pays to educate yourself about what you can do or buy to make it even cheaper to use over time. If you shop carefully, you can save a lot of money and still enjoy high-quality prints. Epson's B-510DN inkjet, with its cheap inks and competitive speed, should make sellers of low-end color lasers worry. It also offers two input trays and automatic duplexing. The rule of thumb with inkjet printers is that the less expensive the printer is, the more the ink will cost you. The rule’s origins lie in ink-cartridge configuration and capacity. Lower-end inkjets might have a configuration with a tricolor cartridge, combining cyan, magenta, and yellow inks into one package. Tricolor cartridges usually end up costing you more, because once a single color runs out, you have to replace all three. Inkjets that offer separate cartridges for each ink put an end to that problem; models that separate the ink tank from the print head can save you even more money. One of the most inexpensive consumer inkjets to run is the $100 Canon Pixma iP4700. It has a separate print head and five ink tanks, a full set of which ships with the printer. The pigment black (PGI-221) costs 4.3 cents per page, while each color costs 2.6 to 2.8 cents per page. A four-color page would cost about 12.2 cents. Photo black, used only with images, lasts for 665 4-by-6-inch photos (about 2 cents per photo). On Canon’s own paper, photos were accurate and sharp. Plain paper presented more challenges: Flesh tones appeared excessively pink, for instance, and text was black but slightly fuzzy. This model comes with an automatic duplexer, which can help you conserve paper, as well. The most economical inkjets we’ve tested are business- oriented models. They carry higher price tags but offer high-yield cartridge options, with a lower cost per page compared to standard-size cartridges. As with anything you buy in bulk, make sure that you can use such cartridges in a reasonable period of time. If you print just a few simple pages per day, buying a cartridge that lasts for 1000 pages would be overkill. The $180 HP Officejet Pro 8000 Wireless Printer, for example, comes with one standard input tray and one optional one, plus automatic duplexing and Wi-Fi support. It uses two print heads and separate ink tanks that load easily into a front bay. Among the standard-size supplies, black costs about 2.6 cents per page, and each color about 2.2 cents. A typical four-color page would cost about 9.3 cents. The high-yield cartridges are an even better deal: Black costs about 1.6 cents per page, and each color about 1.9 cents per page. That pegs a normal four-color page at just 7.2 cents. Overall, the Officejet Pro 8000 Wireless produced very good print quality. Text was crisp and suffered virtually no defects, while grayscale graphics showed a level of detail in darker areas that many printers miss. Color images had a rich (albeit somewhat dark) cast that we often see in output from HP printers. Flesh tones tended to be orangey. Last and least (in ink costs) is the recently introduced Ep­­son B-510DN. This $599 inkjet printer’s consumables are cheaper than those of many lasers we’ve tested. Its standard-size supplies cost 1.3 cents per page for black and 1.4 cents for each color. A full-color page would cost just 5.6 cents. The high-yield colors each cost 0.9 cent per page. Epson offers high-yield and extra-high-yield black inks, priced at 1.2 cents and 0.87 cent, respectively. Built for maximum efficiency, it offers two input trays and automatic duplexing, plus record-breaking speed rivaling that of some lower-end color lasers. Its print quality is very good, too, just fuzzier on plain paper—which is acceptable for text, worse for photos.